Diana Varela is a biological oceanographer and a professor at the University of Victoria. Her team studies the ecology and physiology of phytoplankton, their diversity and production and the chemistry of seawater that impacts their life. Marine phytoplankton are responsible for half of the carbon fixed through photosynthesis on earth. 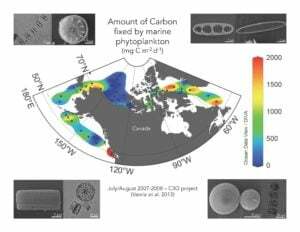 They are therefore important for reducing carbon dioxide levels in the atmosphere, and for the amount of organic matter flowing through marine food webs. Her studies during Canda C3 will provide a pan-Canadian perspective of organic matter production in Arctic and sub-Arctic surface waters, and will add to her previous work in these regions.